A hardworking young woman who has an everlasting faith in dreams but is forced to work as a servant in her own home. However, not even in her wildest dreams would Cinderella be able to imagine that she has an important role to play as a Princess of Heart. Due to her unique status, the Heartless destroyed her world and brought her to Hollow Bastion, where her heart was stolen to reveal the pathway to Kingdom Hearts while she was placed in an enchanted coma. Following her release, she remained in Hollow Bastion and aided the other Princesses to shield the universe from the Final Keyhole's immense darkness. Cinderella, along with all the other Princesses, have the ability to sense great power and thus direct Sora to Ansem's final hiding place. Born the daughter of a wealthy nobleman, Cinderella's privileged life is shattered by the arrival of her stepfamily and subsequent death of her father. Her beauty becomes the target of jealousy of her stepmother and stepsisters, and thus is forced to become a maid in her own home. For years Cinderella endures her stepfamily's bullying by holding onto her dreams, believing that if one works hard for it, those dreams might just come true. 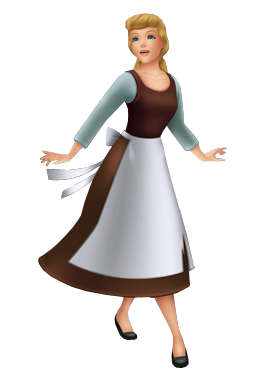 On the night of Ven's arrival in Lady Tremaine's estate, Cinderella is hard at work so that she can finish her chores and attend Prince Charming's royal ball. She comes very close to achieving her dream when Ven and Jaq sew a dress together for her, but the dress is ripped apart by her bitter stepsisters. Overcame by grief and hopelessness, Cinderella's belief in dream threatens to dim, until her Fairy Godmother appears and proves that dreams do come true by conjuring a ballgown, a pumpkin carriage and glass slippers. This renewed hope reignites the pure light in her heart, and she heads to the Prince's castle with Terra as her bodyguard. While at the ball, she meets Prince Charming and falls in love. Her steadfast faith in her dreams and the apparent happy ending gives Terra strength, as his own belief in his dreams are reaffirmed. When the clock strikes midnight, Cinderella flees the ball before the Fairy Godmother's spell expires. In her haste, she leaves behind a glass slipper, and a kingdom-wide search for the girl whose foot can fit the slipper begins. Once the Grand Duke arrives at her house, Cinderella is locked in her own room by Lady Tremaine, and can only escape with the help of Aqua and Jaq. Despite Lady Tremaine's interference, Cinderella is able to prove that she is the one the prince danced with by producing the other half of the slipper. Not even an Unversed summoned by the Tremaines to kill Cinderella can keep her away from Prince Charming, and once they are reunited with the help of Aqua, her pure light shines strong and bright.